‘What is Montmartre? Nothing. What must it be? Everything’, proclaimed Rodolphe Salis in 1881, when his cabaret Le Chat Noir launched an entertainment boom in the 9th and 18th Arrondissements of Paris which would dominate the worlds of popular and high culture until the First World War. Montmartre’s music-halls, circuses, cinemas, accompanied by extra frisson of crime and prostitution, coexisted with burgeoning art movements sprung from the cabarets, which spearheaded the avant-garde in painting, theatre and literature. The story, however, did not end in 1914 and Montmartre retained its role as a magnet for tourists, lured by the Moulin-Rouge and the Sacré-Coeur, and, despite the competition from Montparnasse, as a major centre for artistic creativity in the inter-war years. Crucial to this continuity was, not merely the survival of many of the most important players from the pre-War period, but especially the role of the humorous press and the Montmartre caricaturists and illustrators who congregated in the Restaurant Manière. 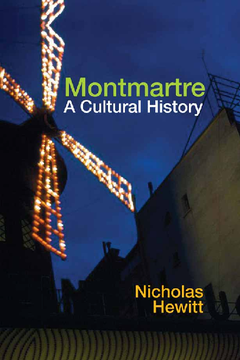 In this new study, Nicholas Hewitt charts the continuity of Montmartre culture from the Belle Epoque to the Occupation through its many overlapping frontiers and explores its vital ingredients of sexuality, kitsch, bohemia, mass culture and the political and social ambiguities of such a mixture.